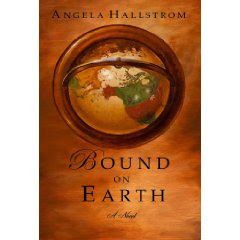 Bound on Earth is a series of narratives, told from different points of view of the Palmers, a Mormon family. Through these vignettes, we learn about each member of the family, at different stages of their lives. It doesn't follow a timeline. Rather, it skips around which gives us a unique view of the characters at different ages. I found the characters to be real, complex people that were so well fleshed out that they could have been sitting next to me telling me their stories. We're first told about Beth, recently separated from her husband. A new mother, she's now living at home trying to figure out how she got there. Her husband's a good guy, but suffers from mental illness and wavers between wanting to get help and not wanting to take his medication. It's obvious that Beth has supported him and stuck around in hopes that he would chose help, but she's then made the painful decision to leave him. A very poignant scene is where he is sitting outside their house in his car during Thanksgiving, wanting to be inside with the family who opened up their arms and house to him when he was a teenager, but seemed to be pushing him away now. We then move on to Beth's Dad and we see him as a younger man and see his struggles. The short stories continue as chapters until the final chapter where the story is wrapped up through the eyes of the matriarch of the family. I was most impressed with this book. I enjoyed the depth of the characters, the honesty of the story, and quality of the writing. It was very beautifully-written and feels very real to me. This sounds like an unique concept to not follow a chronological timeline. I'm also wondering about the characters - their ages and what is revealed about them. Sounds fascinating! Julie, I think you would reall like this book. It's one of the best I've read in the LDS genre; it's so different than most others. I have it if you one to borrow it one of these days. Maybe when I get Harry Potter back to you which I need to do as soon as I finish reading which I should be doing right now.